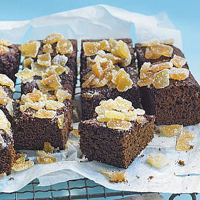 This sticky ginger bread will taste even better if you can cook it a few days – or up to a week – in advance, then store in an airtight container. Preheat the oven to 170°C, gas mark 3. Grease and line the sides and base of a 20cm square cake tin with baking parchment. Remove from the tin and cut into pieces. Store in an airtight tin for 1-2 days (or up to a week, if you can wait that long!) before serving.